Sometimes the weight of expectation is enough to keep me from reading a book I truly want to read. 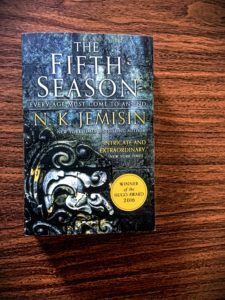 Case in point: I’ve had NK Jemisin’s The Fifth Season on my shelf for almost a year, even though I was sooo excited when I bought my copy. The timing was right, though, since I needed a win after a bit of a streak of so-so reads, and for the most part, this book delivered. The Fifth Season begins with a prologue that introduces the world — and then breaks it. After a cataclysmic tremor emanates from the center of the world, Essun leaves the relative safety of her community to track down her husband who has murdered their son and kidnapped their daughter when he discovered they, like their mother, were orogenes — people who can connect to and manipulate energy within the earth and air, people who are feared and hated for their very existence. At the other end of the world, Damaya, a young orogene, is collected and brought to The Fulcrum, an organization at the center of the world that trains orogenes to mold their power into something useful for the world. And Syenite, a mid-level 5-ring orogene hoping to move up, is matched with 10-ring master Alabaster and sent to an outer province to clear a blockage in a harbor, and though they’re really only meant to produce an offspring, they instead uncover secrets that put themselves and everyone around them at risk. This was a mostly book for me. I mostly loved the world Jemisin built, intricate and original, but there were some internal inconsistencies, especially with what the characters could and couldn’t do with their powers. I liked that she mostly avoided fantasy pitfalls like centering the story around royalty and knights and maidens fair, but the big battle at the end was disappointingly trite. I mostly liked the characters, though some were a little one-dimensional, yet I fully appreciated Jemisin’s inclusive casting with a trans woman, bisexual men, and even a triad relationship. I mostly found Jemisin’s writing to be quite powerful, but she also employed two of my least-favorite literary devices — second-person narration and made-up swear words — and though she was more successful than I expected, I still found both distracting and annoying. It was mostly an exciting, engaging read, but it got bogged down near the end and left me wishing it were more self-contained and less concerned with setting up the rest of the trilogy. As much as I enjoyed the read, The Fifth Season just didn’t linger in my mind after I finished, but I suspect I’ll have to finish the series to get the full impact. The question is whether I’m willing to invest more time and push ahead. I’m just not sure. I enjoyed the rest of this series but I had to force myself to sit down and read, I enjoyed it while I was reading but wasn’t rushing to pick them up. That sounds like how I feel at this point. I’ll probably finish the series and will probably end up liking it overall, but it will also probably take me awhile to get there.